Almost three decades ago Peter Drucker wrote an article called ‘The New Productivity Challenge‘. In it he foresaw the biggest challenge for organizations in the 21st century—how to keep employee productivity rising. The father of modern management, as he is known, was convinced the productivity challenge would “dominate the management agenda for the next several decades”. It would “ultimately determine the competitive performance of companies.” Drucker was right. It has. Drucker’s logic proved so attractive that many other (wannabe) gurus repeated it. What were the big problems of the workplace 100 years ago? Intentional inefficiencies were common, and productivity levels suffered. There were huge inequalities between the lives of the workers and their bourgeois bosses. The working class was very poor. Their bosses were pretty damn rich. The motivational problem of the working class was so huge that they invented a word for it – “soldiering”. It described the attempt among the working class to do the least amount of work in the longest amount of time. The 19th century workplace created a tension between the workers and the bosses. At one point it had grown so high that there was a sort of a Mexican standoff in the workplace. Unsurprisingly, this standoff was a hot topic for thinkers of the time. Karl Marx, for example, predicted a class war. He argued that suppression of the working class would inevitably lead to a revolution. Marx was right – 19th century workplace problems did eventually trigger a revolution—but of a totally different kind to what he predicted. Drucker argues that what defeated these prophecies was not the much-anticipated revolution of the frustrated working class, but the Scientific Management revolution set off by an American, Frederick W. Taylor. Taylor’s motivation? “Taylor, deeply shocked by the bitter animosity between the workers and managers, and fearful that this hatred would ultimately lead to class war, set out to improve the efficiency of industrial work.”, Drucker wrote. And Taylor did. For more than a century, he and his proteges unleashed a quest for optimal workplace efficiency as had never been seen before. This quest is described in most modern-day management books (e.g. Tom Peters’ In Search of Excellence, Gary Hamel’s Future of Management, Julian Birkinshaw’s Reinventing Management, Stanley McCrystal’s Team of Teams, Frederic Laloux’s Reinventing Organizations, etc.). All offer a similar narrative, and with the same set of main characters. Taylor was the first, with his book Principles of Scientific Management. Printed in 1911, it argued (in a nutshell) that thinking work should be separated from doing work – with managers doing the former and front-line employees the latter. Taylor’s theory is known as “the one best way”. It advocates that every job could be reduced to a scientifically detailed, simple, repeatable and mechanical set of activities that even the most stupid, unwilling worker could do. Taylor is followed by a number of other ‘bureaucrats’ who appear on the scene. Henri Fayol, a French mining executive, came up with the useful but rigid organization chart. Henry Gantt, an American engineer, produced his Gantt chart. Max Weber, a German economist, wrote on Bureaucracy. Lyndall Urwick, an Englishman wrote on Scientific Management. Americans Frank and Lillian Gilbert focused on workplace psychology, while Henry Ford introduced his assembly line. But, as well as the bureaucratic narrative, there is a humanistic one. Over the past century there have been attempts to start more ‘human’ movements in management. The quest of the ‘humanists’ was not optimal workplace efficiency but workplaces in which people were free to flourish. Sadly, the ‘humanists’ and their ideas are less known. But they are definitely there. For starters there is American management thinker Mary Parker Follett, who should be coined as the mother of modern management. Then there are MIT Professor Douglas McGregor with his Theory X and Theory Y, Eric Trist of the British Tavistock Institute of Human Relations, Australian researcher Elton Mayo, German psychologist Kurt Lewin, Greek business theorist Chris Argyris, American scholar Warren Bennis, and others. Despite the noble efforts of the ‘humanists’, it was the ‘bureaucrats’ who won the 20th century workplace battle. Taylor’s revolution spurred productivity growth in manufacturing and transport by 3% to 4% per annum in developed countries between 1880 and 1991 (the year of Drucker’s article). This explosive growth gave the working class not only increasing incomes but also access to education, health care and even leisure time. In fact, the revolution succeeded so well that today less than 10% of the world’s population lives in extreme poverty. (It was more than 80% in Talyor’s time.) And almost 90% of the world’s population now has, at least, a basic education. The ‘bureaucrats’ not only won the 20th century workplace battle, they still run the majority of modern-day workplaces in the 21st. A previous post showed data from Gary Hamel and Michele Zanini that highlight the fact that bureaucracy is persistent and growing in most large organizations—with at least 8 layers of management in place. Data from the US Bureau of Labour Statistics show that, despite the technological developments of recent decades, the class of managers is growing more rapidly than other occupation roles (that is, the people at the front-line doing the real work). The growth of bureaucracy comes at a cost. Indeed, it costs a crazy amount of money. According to Hamel & Zanini, the excess of bureaucracy in the US alone costs $3 trillion per year. For the OECD countries, they estimated the figure to be ~$9 trillion! This is not a good sign. What happened after Peter Drucker dropped his productivity challenge? What happened to the annual productivity rate after 1991? What happened to the inequality between employees and bosses in recent decades? 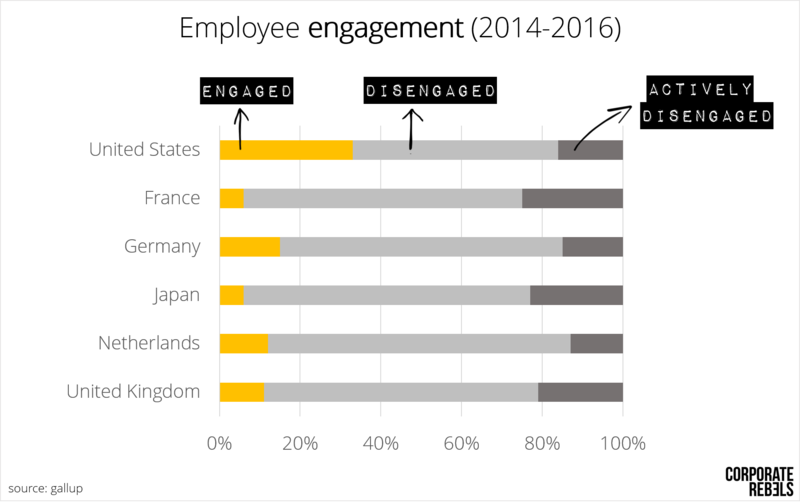 And what happened to the disengagement levels of the workforce in general? Let’s try to answer these one by one. Let’s first take a look at the productivity levels of the last few decades. Looking at this research from the Organization for Economic Co-Operation and Development (OECD), it seems we are in similar situation to before the industrial revolution. 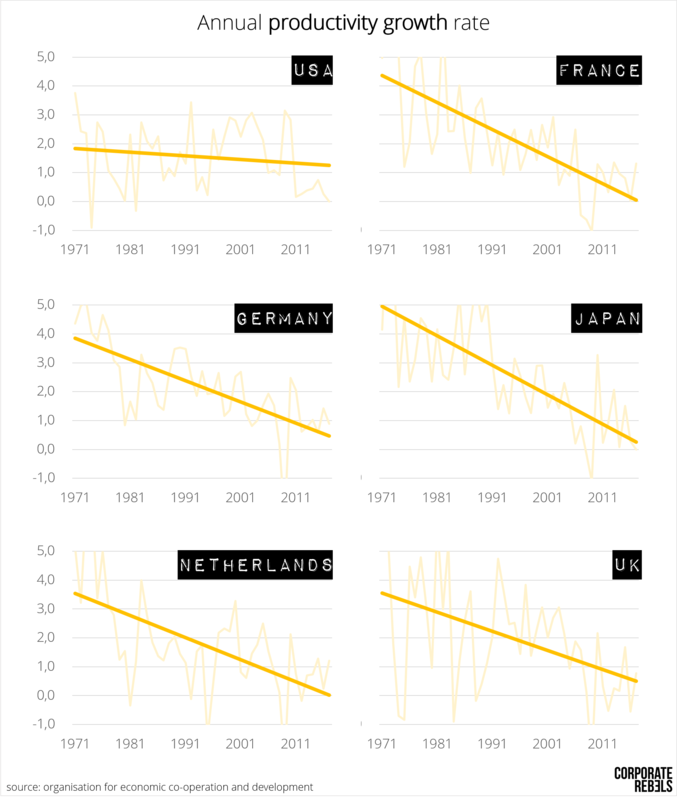 Since the 1970’s, productivity levels in many developed countries stopped rising—as the graph shows. And nobody really knows why – the economists are puzzled by this. Next question: What about the inequality levels over the same period? Let’s look at data from the Economic Policy Institute on salary differences between the workforce and their bosses. These data show the enormous income divide between top managers and front-line staff. In recent decades it has exploded. Once again – nobody really knows why. It seems we have seen this before: bosses getting pretty damn rich, despite the fact that productivity of the workforce is no longer rising. Now, let’s look at the research on engagement in the modern-day workforce. For this we look to Gallup’s data. If you are a frequent reader of this blog this will not be a surprise. We have written about this problem several times before. Gallup’s data show we are experiencing a workplace disengagement epidemic. Virtually everywhere in the world, two out of three people are disengaged from the work they do! Is it true we haven’t improved much since the era of ‘soldiering’? It shouldn’t now come as a surprise that these problems impact the productivity of the workforce and, as a result, business performance and competitiveness. It is now obvious that many corporates are losing because of the bureaucracy burden. We all know about Enron, Kodak, Nokia, Lehmann Brothers and Blackberry. But there is more. There are more losers who seem to have become so comfortable with Taylor’s status quo they find it hard to change. Of the original Fortune Global 500 companies in 1955, only 12% survive. More shockingly, 52% have disappeared in the last 15 years. While bureaucratic organizations are disappearing at the speed of light, their lifetime is reducing as well. Research by Innosight showed that in 1960, the average company in the S&P 500 enjoyed a lifespan of about 60 years. This has dropped to only 24 years in 2016. By 2027, the lifespan is expected to be just 12 years. Innosight’s findings fit perfectly with research conducted by the Santa Fe Institute. They studied 25,000+ publicly traded North American firms between 1950 and 2009 and found that the average public company has a half-life of about 10 years. The survival struggle is not an exception. It seems to be the new norm. An unavoidable 21st century workplace revolution? With so many losers in the workplace, the time is ripe for a new revolution to beat the 21st century productivity challenge—and now more than ever. The world of management is becoming a collection of dead ideas. A 21st century workplace revolution seems to be unavoidable. Fortunately, we are in a better position than our ancestors of a century ago. We know productivity can be raised. Just like Frederic Taylor a century ago, there are pioneers showing us how to beat the productive trap. Because there are not only losers—there are also winners in the game, and they are to be found around the world. We can learn a great deal from these winners. They show us how to beat the productivity challenge holding most managers in a headlock. We have identified 100+ of those winners from all corners of the globe. But our research didn’t consist of just reading books and articles. We visited every single one of them. We talked extensively to founders, to bosses and to employees. We tried to figure out what progressive organizations do differently, on a daily basis. Progressive organizations no longer focus solely on shareholder value. They focus on building a workplace around common purpose and values. Having purpose and meaning gives people the energy, passion and motivation to get out of bed in the morning. It fosters communities of like-minded employees, customers, suppliers and others. And inspiring work cuts through bureaucracies, silos, and egos to unleash the potential of the organization. Progressive organizations know the pyramid is out-dated. It simply does not fit with today’s fast changing environment. The rigidity of command-and-control does not promote agility, speed and engagement. Progressive organizations tend to adopt alternative structures. Typically, they turn the rigid pyramid into an agile network of teams. Each team has skin in the game. They feel the impact of their (financial) successes and failures. This increases responsibility, entrepreneurship, communication, adaptability and a willingness to support each other. Within progressive organizations, we see a supportive style of leadership: strong leaders, supportive of those ‘closest to the fire’. They challenge the status quo – the way things have always been done – and encourage the entire organization to do the same. Their leaders walk the talk. They embody organization mission and values. They are crucial to an organization’s culture. They do everything in their power to remove barriers. They help employees thrive. Authority is no longer linked to rank, but rather to the ability to lead by example. Progressive organizations abandon guesses masquerading as precise predictions. They embrace experimentation in everything they do: products, ways of working, and even structures. Change is no longer a once-in-a-year event. It’s part of every-day work. The adaptive organizations we’ve studied believe it’s better to experiment and fail than to never make mistakes at all. Progressive organizations act on the belief that employees are responsible adults who can be trusted. They don’t need extensive control. They perform best when given a high degree of autonomy. They can be trusted to do their job in the way they see fit. They let employees decide where, when and with whom to work. Progressive organizations tend to be highly decentralized. They act on the belief that employees on the frontline have the best understanding of customers, suppliers, and production machines. Therefore, frontline employees should make the majority of the decisions—if the aim is to be agile in response to clients. But don’t be fooled. With freedom of decision-making comes responsibility and accountability. Progressive organizations tend to be ‘open by default’. They turn radical transparency into a valuable tool. They foster an ‘ask anything’ mentality. They grant company-wide access to data, documents, financials—in real-time. They give people the right information at the right moment. This means better decisions, faster—and problems solved, sooner. They also promote collaboration inside and outside the organization. Progressive organizations try to make use of the diverse talents present in the whole organization. They offer people the freedom to choose their tasks and responsibilities. In progressive organizations, employees ‘sculpt’ their jobs based on interest, talents and strengths. Why? Because people prefer working on tasks they like—tasks that fit their talents and strengths. We know that doing what you are good at increases motivation and engagement. We are hardly the first to advocate a more human management revolution. Gurus like Charles Handy, Tom Peters, Henry Mintzberg and Gary Hamel have preached a ‘human first’ mantra for years. What is different now is we seem to detect early signs of a global human management revolution. Some progressive organizations have been able to spread their wings, and their fresh ideas, around the world. Pioneers include the Dutch healthcare organization Buurtzorg, and Chinese manufacturer Haier. They are disrupting their industries, by organizing completely differently – and on a global scale. They practice a ‘human first’ mantra. They manage to beat the productivity challenge Drucker predicted decades ago. They eliminate bureaucracy and useless layers. Ironically, some of these pioneers manage to lead the revolution by organizing thousands of people without a single appointed manager. The ‘human first’ mantra is clearly the way forward. This is the human management revolution of the 21st century. The context you provided to all who work to influence and inspire change in the world of work is an immeasurable gift. The raw data, the history, the reality of what is and the wide divide to cross can make for a lonely journey. You give us courage to continue. Thank you from the bottom of my heart! Why do you keep using the military jargon? “closest to the fire”, “frontline” — we are talking about servicing our customers, not killing enemy soldiers! I have been out at customers being angry about our company’s progress. That’s why I think the terms are correct. The bureaucrats in the back office cared about following policies and regulations, leaving you alone out there. Yes! The productivity trends are pretty compelling. (I would include P Senge in your list of humanist management pioneers). It is required to be honest when you plan another type of talent management therefore some people do not like to change paradigms. Rebellion is the only effective course of action against damaging practices, unfortunately.